Since John F. Kennedy founded the Peace Corps in 1961, more than 150 Whitworth alumni have participated in the service-oriented program in dozens of countries. Alumni who have served in the Peace Corps span a variety of majors over many decades. In addition, several Whitworth professors have served in the Peace Corps, including Assistant Professor of English Nicole Sheets, who recently was assigned to the Republic of Maldova. Brooke Evans, '01, and Susan Ahrens, '95, are two of the six Whitworth alumni currently working with the Peace Corps. They departed to their countries of service in 2011, where they will work until 2013. Brooke Evans' interest in the Peace Corps began at age 14, when a guest speaker came to her high school to talk about the opportunities within the organization. From then on, she says she knew it was something she would do at some point in her life. Evans considered joining the Peace Corps after graduating from Whitworth, but she chose instead to accept an Emerson Hunger Fellowship with the Congressional Hunger Center. After graduate school, she discovered a fulfilling career as program director of community-based crisis mental health services in Hawaii. She also served as a part-time social work instructor at the University of Hawaii at Manoa. Evans decided she'd probably wait to volunteer for the Peace Corps until retirement, but a couple of years ago, she says she found herself at a good break point in her career and it felt like the perfect time to think about Peace Corps service again. "As a social worker, I was looking for ways to practice and learn about my profession abroad, and working with Peace Corps felt like the perfect way to do that," Evans says. "I was also feeling excited about learning another language, and seeking a bit of an adventure and change of pace in my life. Peace Corps has been a wonderful way to accomplish all of those things." 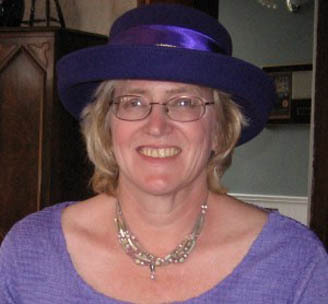 Evans was placed in Mongolia, where she says social work is a relatively new profession. She is one of 14 volunteers with Mongolia's Community Youth Development (CYD) project. Each volunteer is placed in a different agency, and Evans is in the capitol city of Ulaanbaatar. She works with the Mongolian Association of School Social Workers, a nongovernment organization focused on training and professional development, capacity building, and advocacy for school social work in the country. In her work, Evans trains school social workers, teaches university students, and gives community presentations on topics such as U.S. social work practice, mental health, sexual violence, substance and alcohol abuse, and youth-related depression and suicide. She also conducts research and is currently writing a paper and presentation on Mongolian school social work practice, which she will share at an international conference in Ghana. In her spare time, Evans is a part of Agaa-Egee, a start-up project for youth in orphanages that resembles the American Big Brother, Big Sister program. Evans advises students considering entering the Peace Corps to understand their motivations for service, be realistic in their expectations, and be prepared for just about anything. If they feel open, flexible, drawn to service, and ready for personal change, she encourages them to apply. "I love the Peace Corps expression that it is 'the toughest job you'll ever love' because it sums up the Peace Corps volunteer experience so well," Evans says. "Peace Corps service is amazing – it stretches you to think in new ways, it exposes you to alternative cultural beliefs and experiences, it pushes you to examine your privilege as someone from the United States, and it helps you learn to work and live in very different conditions than you are used to." 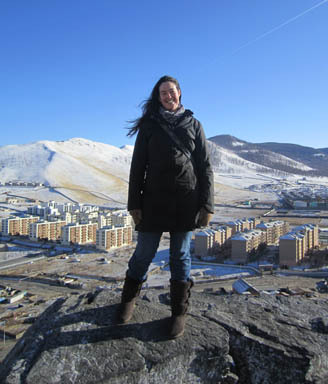 For Evans, who graduated from Whitworth with degrees in communication studies and political studies, learning to think critically at Whitworth was a skill she says she's used in graduate school, the workplace, and now in Mongolia. She says she appreciates being exposed to many different fields through a liberal arts education. At Whitworth, Evans says her most influential professors were Professor Emeritus Ginny Whitehouse and Professors Mike Ingram and Ron Pyle, all of the communication studies department, and Professor of Political Science Julia Stronks. "Each of these individuals helped me become the person that I am," she says. "They assisted me academically, professionally, and personally. In fact, they all still play a role in my life today. They taught me to think, synthesize information, write, speak, and find my place in the world." Evans arrived in Mongolia last June and will leave in August 2013. When she returns to the U.S., she plans to pursue a Ph.D. in social welfare. Wanting a fresh start after her business closed, Susan Ahrens began considering work abroad. Her daughter suggested she look into the Peace Corps. Ahrens took her advice, and in July 2011 she left for her 27-month assignment in South Africa. Ahrens' first two months were spent learning the Setswana language before starting her position as resource specialist for two primary schools. She spends most of her time teaching English and computer classes, but also occasionally teaches classes in math, social sciences, natural sciences, and arts and culture. Part of Ahrens' work is also to support initiatives by government and non-government organizations promoting HIV/AIDS awareness and education in schools and communities, as well as to develop strategies for handling the subject in schools. She works with school administrators, educators, parents and community members to strengthen partnerships between schools and the community. She's also initiated community programs designed to empower youth who have finished school. Ahrens says the people she's met have been very welcoming, and adds that the people are the most rewarding part of her job. "To learn in-depth about another culture and make new friends both young and old is something that can't be compared to anything else," she says. One of Ahrens' greatest challenges has been teaching in schools that lack basic supplies. "People have been asking me what the schools need. They need everything," she says. "Supplies, balls, games, construction paper, compasses, protractors, rulers, scissors, playground equipment, crayons, colored pencils, money for uniforms, and books, books, books." Ahrens encourages students considering the Peace Corps to learn patience, for both the organization's long application process and their actual work abroad. "My teaching degree from Whitworth prepared me to be able to walk into classrooms a world away and teach in a respectful and professional manner," Ahrens says. Since President John F. Kennedy established the Peace Corps by executive order on March 1, 1961, more than 200,000 Americans have served in 139 host countries. Today, 9,095 volunteers are working with local communities in 75 host countries. Peace Corps volunteers must be U.S. citizens and at least 18 years of age. Peace Corps service is a 27-month commitment and the agency's mission is to promote world peace and friendship and a better understanding between Americans and people of other countries. Visit www.peacecorps.gov for more information.